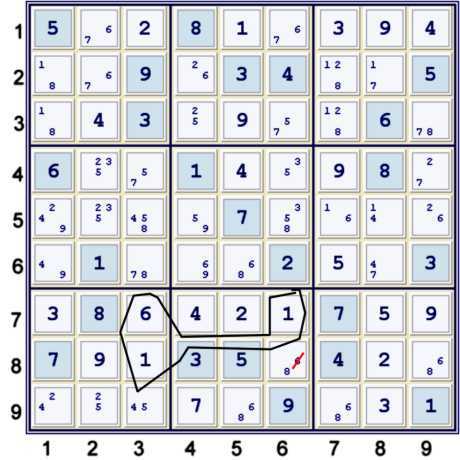 The following is the final page of an illustrated solution for the sudoku.com.au tough puzzle of 12/21/07. The first page primarily attacked candidates 78 and their grid interactions. The second page included a mixed bag of steps. Perhaps the most significant being the use of a strong inference set (sis) generated from the recognition of an Almost Unique Rectangle (AUR). This page contains only very short steps. The only ones of any significant interest again use the concept of an AUR. Previous blog pages may be helpful. Links to these pages are found to the right, under Previous Entries. Since the puzzle is now significantly unlocked, the possible solution path selection herein is completely arbitrary. The steps below have been selected primarily for their potential as instuctive examples. This deduction is primarily an excuse for publishing the current possibility matrix. This is one of those instructive examples. Although there are many solution paths to take, this one leads to a quick and eventually powerful deduction. Note now that each member of the AUR sis can easily link to candidate 6. This leads to a quick elimination. In many ways the latter of these sis is the most important. It serves to truncate the AUR sis, as it is weakly linked to two of the AUR sis members. However, one really need not realize that. Nevertheless, it is this realizaton that immediately let me know that the tri-location AUR sis would act like a bi-location sis. Although this particular 6 seems innocent enough, it quickly leads to another elimination and some solved cells. The puzzle continues to move along quickly. 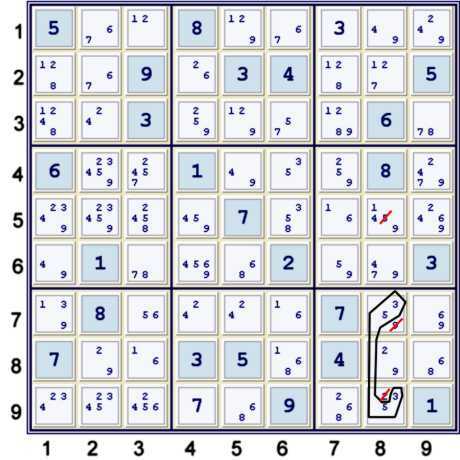 The newly stronger 9's in Box 6, Column 7 provide the easy link to (4=9) at both r4c5, r6c1. In order to use this AUR, all that is required is that none of r78c36 be given. Previously noted AUR sis(step 2j: (258)r7c3=(8)r8c6 => (8)r8c6 %AUR. Above, one can treat the AUR sis just like any other sis. Thus, we have a different type of Hidden Single. Thus r8c6 is solved as 8 since it is the only value left in the Almost Unique Rectangle (16)r78c36 Strong Inference Set. This seems to be an efficient manner to complete this puzzle. I had been reluctant to use Uniqueness in my solutions. I have since changed my mind. 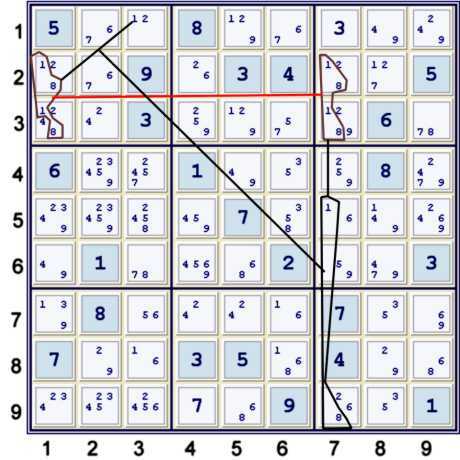 If one accepts that published puzzles have no more than one solution, then Uniqueness creates many implied weak links. One can thus derive Uniqueness Strong Inference Sets and use them just like any other derived sis. They fit nicely into all existing theories/techniques that examine sis interactions. One may need to note that no derived sis carry the guarantee of conjugacy. In other words, members of a derived sis generally do not form a weak inference set. Since Uniqueness, as it is usually applied, means that a puzzle can have no more than one solution, it is a kind of mega weak link that is prevasive accross the puzzle. As such, it seems perhaps more consistent to build Uniqueness sis starting from individual Uniqueness weak inferences. For that reason, the illustrations of AUR's in this solution generally show a weak link between two Almost Hidden Pairs. 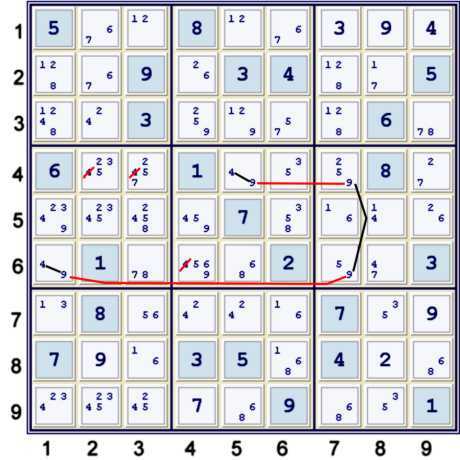 Because Uniqueness considerations lack the symmetric homogeniety of the other Sudoku rules, it seems problematic to assign depth and difficulty to them. This is further complicated by the fact that, for example, one need not even have the possibility of multiple solutions in order to execute Uniqueness sis steps, as demonstrated above. 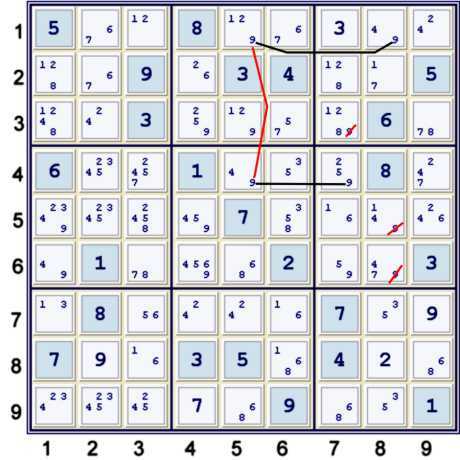 In other words, the necessary and sufficient conditions for a Uniqueness deduction seem completely assymmetic with the other sudoku rules. This is easily understood by example. Above, if any of r78c36 were given as 16, then one could not use AUR 16 on those cells. However, since they are not given, one is free to use that AUR 16 at any time one chooses. Thus, there is some sort of deductive difference in value between solved cells and given cells. is clearly relevant to the given puzzle, which is completely defined by only the given cells. 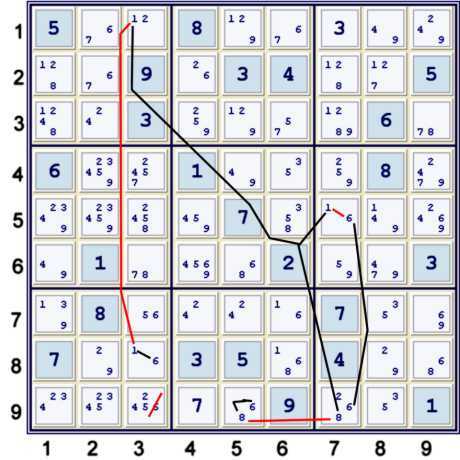 This difference indicates that all the power of applying uniqueness exists at the puzzle start. It is pervasive throughout the puzzle solution, but always completely present from the very beginning. Harnessing this power at the very start is not well understood. In my opinion, the complete power of Uniqueness considerations is much greater than generally recognized. Unfortunately, the ability to investigate this power theoretically is probably beyond me. 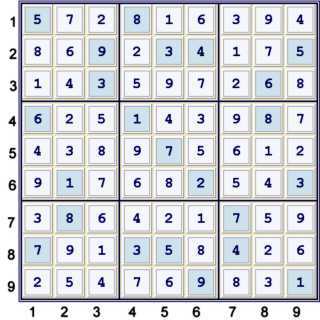 Nevertheless, it is one of those items about Sudoku that I find truly interesting.